We reached Everglades City and drove around looking for the Mullet Festival. 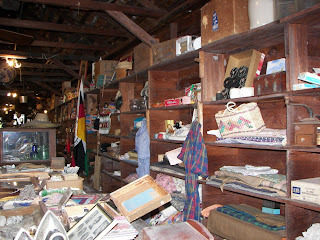 We saw signs for Smallwood Store on Chokoloskee Island and went to investigate. This store was build in 1906 by Ted Smallwood and served this remote community and the Native Americans that lived in the area until 1982. 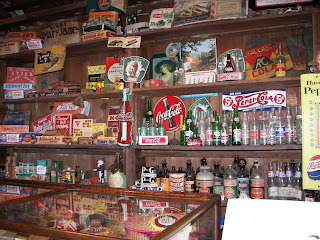 It bought and sold goods and served as the first Post Office. 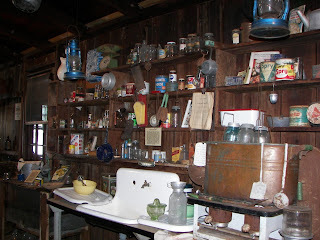 His daughters now operate it as a museum. Just look at the wonderful merchan-dise! 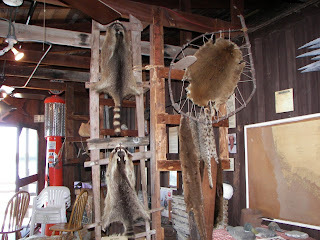 This is the hide room with all sizes and shapes of pelts. Bill and I felt like we had stepped back in time - but we had to come back to the present and find the Mullet Festival! Back in Everglades City we stopped for lunch at a wonderful little local Cuban restaurant (whose name I forget!). We ate outside by a stone wall. 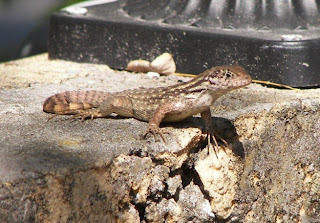 These curly tailed lizards were everywhere! The waitress told me they are native to Cuba and arrived in the Everglades in 1992 along with Hurricane Andrew - one of the most powerful storms (Category 5) of the Twentieth Century. And back in Everglades City we also found out that the Mullet Festival was in Goodland! We took one more side trip before heading to Goodland. 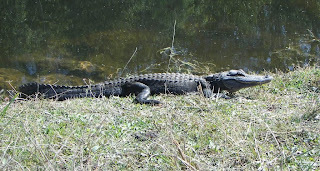 I wanted to see more alligators and my wonderful husband indulged me by going 7 miles in the opposite direction to a place we had been before. I knew it was home to lots of fearsome looking reptiles. 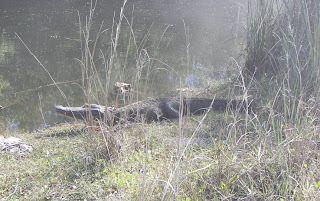 This alligator was sitting by the side of the road. I was no more than 6 feet from him. Just to his right was another - much bigger one! It looks like smoke or fog in this picture - but it is just dust from the road. A car had just gone by and stirred it up. I didn't want to wait until it settled to continue taking pictures as the alligators were getting restless and starting to move. This Alligator must have been 15 feet long. No I wasn't close - he was across the canal. After I got my fill of alligators, we finally headed to the Mullet Festival in Goodland. 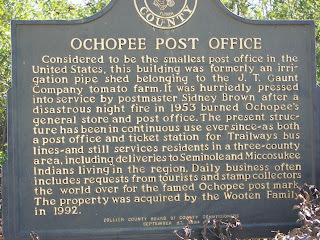 Along Route 41 (Tamiami Trail) we had to pull off and get a picture of the Ochopee Post Office. 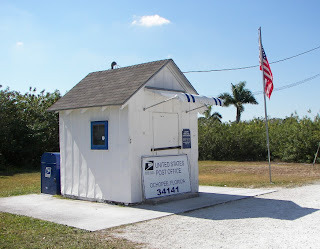 It is the smallest Post Office in the country. Click on the image for a larger version and read the interesting history of this little gem. We found Goodland on our map. It's located on the southeast corner of Marco Island. We found the sign "Welcome to Goodland" but we never found the town or the Mullet Festival! 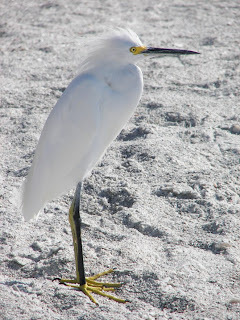 Instead we stopped at one of the beautiful beaches on Marco Island to walk, pick-up shells and look at the birds. 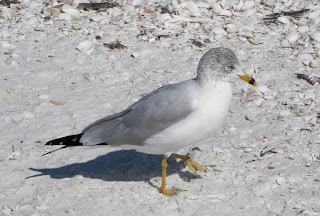 This is a Ring-billed Gull, obviously named for the black ring around his bill. 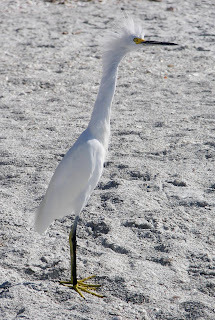 This Snowy Egret was sitting on the beach right in front of a couple who was ignoring him. Suddenly, he heard or saw something and came to attention! Look at the feathers on his head and look at the extension of his neck. He almost looks comical. Bill and I had a wonderful day - even if we never made it to the Mullet Festival - where ever it was. 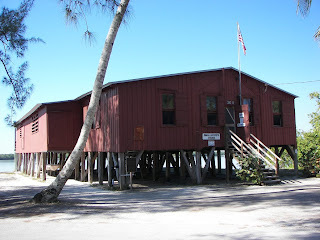 There is a Seafood Festival in Everglades City in a couple of weeks - maybe we'll go.